Right after I graduated high school in Boca Raton, Florida (in 1974), my parents generously paid for my airfare and hotel accommodations as a graduation present so that I could audition for the American Academy of Dramatic Arts. Two weeks later I received a letter saying that I had been accepted. I can't tell you how elated I was because my dream had always been to live, train, and work as a professional actor in New York City. So when the summer of 74' came to an end, I eagerly boarded a plane from Fort Lauderdale to JFK Airport and began a new adventure away from my family and friends. 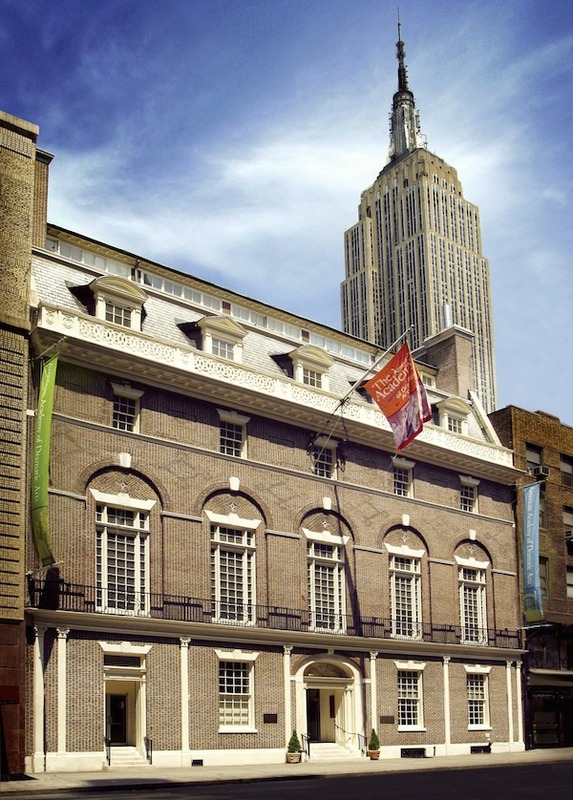 The American Academy of Dramatic Arts (at the time I attended) was a two-year program, however, the students had to be asked back for the second year. And by "asked back" I mean we had to perform in several exam plays at the end of our first year, while being reviewed by teachers and executive staff members to see if we would be returning the following year. I was not asked back. At first I was crushed because a) I immediately learned what rejection felt like in this profession. And b) I was embarrassed because practically everyone I knew in school HAD been asked back. But I have to say, going through the rejection process early on in my life was very beneficial because it taught me how to develop a thick skin by not taking rejection so personal. It also taught me to keep a positive attitude that when one door closes another one opens, and that everything happens for a reason. Therefore, I will always hold fond memories of my year at the American Academy of Dramatic Arts because not only was I able to fulfill a dream, but it ended up being an extremely valuable life experience as well. Last month while I was in New York City, I revisited my old acting school. And it's funny though, because I didn't consciously plan to go back on that day, however, I found myself walking down Madison Avenue not far from where it is located. So I thought, "Why not go inside and take a look around?" Upon walking into the lobby, I met a very sweet and kind lady sitting at the front desk who allowed me to take pictures. When I told her that I had attended the school back in the 70's, she smiled and said, "How does it feel to see it again after all that time?" I said, "Wonderfully sentimental!" It was strange because as I looked around, it appeared as if nothing had changed or been altered. The school looked exactly as I remembered. It was as if 1974 stood still. Can you believe it? Robert Redford! Update: Late this afternoon I received a lovely email from the Director of Alumni and Media Relations at the American Academy of Dramatic Arts, saying that she found this post online today (via media alert) and enjoyed it. She also expressed how happy she was that I was able to stop by and revisit the school last month. She welcomed me back any time. How cool is that? Wow Robert Redford! You have wonderful memories, Ron, as well as having some to be proud of. It's good that you didn't allow disappointment to stand in your way. From all you have told us you had a good early life with plenty to be proud of. Still have, my friend. I love the shot of the staircase and mirror, I bet that mirror could tell a few tales. Ron, I had no idea you were interested acting. What an amazing experience it must have been to live in New York at such an early age and go to acting school. Did you pursue a career after school? Do you still act? I would be interested in knowing. Robert Redford, wow! What a beautiful picture of the staircase and mirror! That must have been both wonderful and bittersweet to go back. I'm glad that you didn't allow the end of that experience to jade you. And I was going to ask if any in your class went on to become well known! I remember Peter quite well from my days of watching Y&R! Ha! Oh my god Ron, I remember Peter Bergman from the soap opera's All My Children and The Young and Restless! How interesting to read that he dated and then married Christine. That must have been such an awesome experience to go back to your school and revisit again. I love your outlook on taking what happened to you and then learning from it. I'm sure it was hard back then, but you took a negative and turned it into a positive! Did you ever meet Robert Redford? I feel very blessed to have had parents that supported me in my pursuit to acting, because they gave me MANY opportunities to do so. Yes, for as long as I can remember back, I always had the desire to be an actor. When I was a kid, I used to put on shows in the garage when other kids in our neighborhood. After going to the Academy, I stayed in New York for 5 years and continued my studies at different schools while auditioning for various shows (plays and musicals). I then moved back to Florida where I also pursued my acting career. 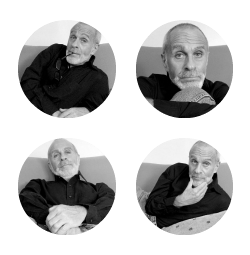 I worked for many, many years in professional theater companies and also traveled to various places in the US, Europe and Asia, where I did shows. However, I eventually changed directions in my life and pursued other things that interested me. But who knows, one day I may go back to acting just for the fun of it. Acting is one of the careers that you can always return.
" I remember Peter quite well from my days of watching Y&R! Ha!" YES!!!!! You are absolutely right! He was also on All My Children. "I remember Peter Bergman from the soap opera's All My Children and The Young and Restless! " Yes, yes, yes...you are right about that!. He got work immediately after graduating from the Academy, as well as Christine and Diana Scarwid. In fact, they all continue to work in movies, television and theater. I remember seeing Peter and Christine walking together during our school year and thinking what a great couple they made - both handsome and talented! My year at the Academy taught me so much. And not only about acting, but also life. I'm so grateful to have had that experience and parents who supported me. "Did you ever meet Robert Redford?" Thanks so much for stopping by, neighbor. Have a grrrrrreat week! Looks like a lovely place and I'm glad your have fond memories of your time there. The life lessons you learned because of your experience has served you well throughout the years. Yes, they've turned out a lot of well-known actors and actresses. I'm betting for every graduate that "made it," there are many more who went on to pursue other careers. Also, there's probably a plethora of actors and actresses that have been successful without their instruction. AND, don't forget, Lucille Ball was considered a "failed" B-list actress....and Marylyn Monroe was advised to become a secretary by the performing arts professionals! HA! Ron, I so love that you shared not only the experience of going back to your acting school with us, but also the lessons it taught you. "it taught me how to develop a thick skin by not taking rejection so personal. It also taught me to keep a positive attitude that when one door closes another one opens, and that everything happens for a reason." Those are important lessons for ALL of us because in one way or another we all go through rejection. I just about died when I saw the photo of Peter Bergman because I used to watch him on The Young and Restless. I had such a crush on him. And Robert Redford too Lol! Thank you for sharing your experiences, Ron. You've led such a diverse and interesting life. Ron, what an experience you had at such a young age! Even though you didn't get "asked back", no one can take away what you had for a year! And like you said, it taught you about rejection, which, no mater what age, you will experience, over and over. WOW! Robert Redford! That's amazing! And the school was originated in 1882!! I love the late 19th century and had no idea there was such a school! Wonderful post. Beautiful photos, memories and history!! "Those are important lessons for ALL of us because in one way or another we all go through rejection." I love how you said that because it's so true....we all in one way or another experience rejection throughout our lives. As I shared, I learned a lot from that experience. And probably more than had I been asked back. Robert Redford actually came back to the Academy during the year I was there as a guest speaker to share about his career and things he had learned. The movie, The Way We Were had been released the year before, so he talked about that as well. Thanks so much for stopping by, girl. Have a wonderful week too! Hope your 4th of July was a good one! Lisa, you are so spot on in comment about what you shared concerning the actors and actresses who attended the school and were asked back. Yes, many did go on to become well-known working actors, but so did many who attended and did not get asked back. And as you said, there are many actors who made it without ever going to any school for training, they simply made it on their own by sheer determination.
" AND, don't forget, Lucille Ball was considered a "failed" B-list actress...."
Yup!!! You are right about that, Lucille Ball was told while in acting school that she did not have talent - and look at what happen to her - she went on to become an comedy icon! Thanks so much for stopping by, my friend. Have a grrrrrreat week! "it taught you about rejection, which, no mater what age, you will experience, over and over. " Yes...yes...yes! You are so right about that. Rejection is a part of life; everyone's life. So I wouldn't trade my experience for the world because it was a valuable "life lesson" that I was able to take with me on my journey. "And the school was originated in 1882!! I love the late 19th century and had no idea there was such a school! " Me too, and neither did I until I attended. The school was originally in a different location in New York. However, the year I attended it was in the spot it is now - Madison Ave. They also have an Academy in California - LA. P.S. Happy Belated 4th of July! Gosh, Ron, that's such a moving story. It must have been so painful to be rejected like that at such a young age. I admire you for being able to recover from that experience and actually learn something from it. You took such excellent photos of the place. I love that staircase picture and I can just picture you stopping in front of the mirror to check your appearance! Thanks so much for sharing this post with us, buddy! Take care! Ron, I really admire you for not allowing that experience at such a young age to affect you negatively. You were able to eventually see why it happened and what you learned. That's something I am trying to do in my own life, see things from an advantage point rather than a disadvantage. Great photographs, dude! Love the staircase and mirror. And it's really neat that the director of the school found this post and then was nice enough to contact you. VERY cool! In retrospect, this experience was the best thing that could have happened to me at such an early age and at the beginning of my career because it prepared me for the future. I made me more resilient. "I love that staircase picture and I can just picture you stopping in front of the mirror to check your appearance!" And back then I had an afro hairstyle, so I would take out my pick and fluff my curls in the mirror - ha! "That's something I am trying to do in my own life, see things from an advantage point rather than a disadvantage." Me as well. Trust me, it's still a challenging thing for me to do at times. But it does get easier. I'm grateful for this experience because it prepared me for the rejection that comes with the acting industry. It also taught me to appreciate the times when I did get jobs. I had a lot of wonderful opportunities when I was still acting; cast in some really great roles. I was so surprised and delight to get that email this afternoon. That was so nice of her! Oh Ron, thank you for sharing the link to that post. I enjoyed it so much. Hilarious! Aw...glad to hear you enjoyed it, Elaine. I can't believe I did that - ha! Thanks so much for stopping back, neighbor! It must have been quite a shock not to be asked back - so glad you learned something from it and remained positive. I was always top or second best in my class except for maths, which I failed (a big national exam) and had to re-take. I still remember the shock of failure. I re-took it and passed, but that first shock was very beneficial to my 16-year-old self. After all, success comes from how we deal with failure. Thank you for sharing your own experience on this post topic, you've added so much! "I still remember the shock of failure. I re-took it and passed, but that first shock was very beneficial to my 16-year-old self. After all, success comes from how we deal with failure." I love that! And are sooooooooooo right...success comes from how we deal with failure. Which is why I don't believe that anything is really a failure, as long as I LEARNED something from it. Have a greeeat week, my friend. And thanks for stopping by! Wonderful photos, as always! How nice was that… ending up at your old school and then receiving an email with a welcome back… one of those full circle moments. Confession: Although not very often these days, I do still tune in to a few minutes of Y&R if I'm working in my craft room around lunch time. My mom was a faithful viewer for years, so it sometimes reminds me of her. I have to start with the end of your post because how freakin cool is that?!?! Anyways Ron I think you are so talented and those teachers missed on not asking you back but you know what? I am glad they didn't. Because if they had you may have become a big shot movie star and become too good for us blogging pals! Everything happens for a reason and I am glad your path led you to us! It's soooooooooooooo great to see you! And do you know whats ironic? You have been on my mind for the past couple of weeks; wondering how you were and what you've been up to. So, thank you for stopping by! "ending up at your old school and then receiving an email with a welcome back… one of those full circle moments. " Yes, I thought the same thing. It was as if the whole thing happened as it was supposed to. coming full circle! "Although not very often these days, I do still tune in to a few minutes of Y&R if I'm working in my craft room around lunch time. My mom was a faithful viewer for years, so it sometimes reminds me of her." I was never a big soap opera watcher, but knew that Peter was on The Young and Restless and All My Children from a friend of mine in Florida who was literally ADDICTED to daytime soaps. In fact, she bought a VCR so that she could tape them during the day while she was at work so she could watch them at night - ha! Have a great week, neighbor! I honestly believe that every DOES happen for a reason because although I wasn't asked back, my career ended up being a very full and rich one because of the great opportunities I got to play in some awesome shows. It also made me more resilient to life's detours and challenges. I feel genuinely grateful for my time at the Academy! Thanks for stopping by, my friend. Have a grrrreat rest of your week! I was in NYC again today, and I just got back. I had so much fun! When we're young, it's soooo hard to deal with rejection. To have somebody burst our balloon. But as you so wisely learned, rejection isn't fatal. In fact, it makes us stronger if we'll let it ... and certainly wiser. Awesome tour of a special time in your life -- thanks for letting me tag along -- though, you know, coming up those stairs and seeing myself in that mirror would probably freak me out until I got used to seeing it, ha! Ron, perhaps you have in the past (before I started reading your blog) but did you ever share your theatrical experiences? I would love to read them. "Peter Bergman is on the soap my mom watches every day! " Ha! 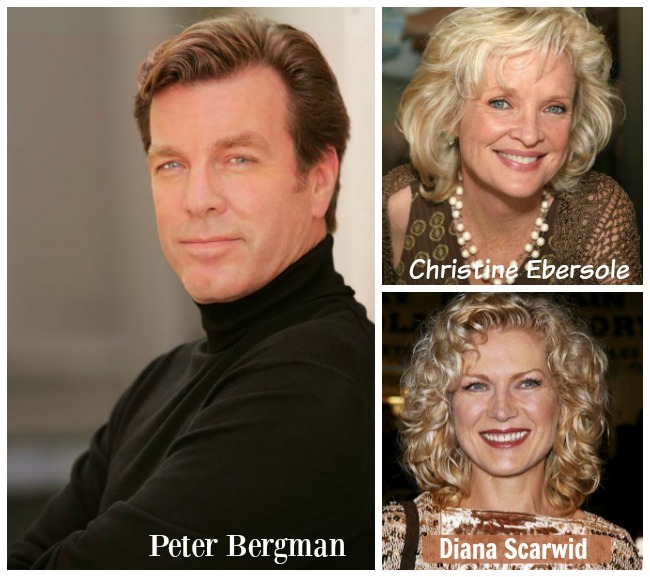 I can't over how MANY people know of Peter Bergman because of the soap opera's he's been in. I was never a big soap opera watcher, so I never really followed his career. However, I did see him occasionally while TV surfing and caught him. I wonder if he is still on TV? Christine Ebersole and Diana Scarwid, I have followed a lot from the movies and theater they've done. "In fact, it makes us stronger if we'll let it ... and certainly wiser." Yes, is certainly does, you are spot on about that. Which is why I feel extremely grateful for those times. They've made me more resilient to life's ups and downs. Thanks so much for stopping by, my friend. Have a great rest of your week too! Gosh...I can't believe how fast this week flew by! I'm envious that you managed to get in at all, Ron. I was heavily into drama when I was younger (you may remember the posts I wrote about my time with a theatre group, performing at the Edinburgh Fringe Festival and the shows I did with Ho) and I applied for, and got, a place at drama school, to study stage management. But the local arts council, who had to approve funding for student grants at the time, refused to accredit the course I'd been accepted on and I couldn't go. I even went back the following year and was instantly accepted again on the course, but the council still refused my grant application, so I had to go get a proper job and my theatrical ambitions ended there. It has always pissed me off that bureaucracy denied me my chance to get into that creative world, so maybe my blogging adventure is a small way of regaining that feeling of producing something original for an audience again, such as it is. Great photos, too, by the way. What a great experience, Ron. I'm glad you got to pursue your dream; even though it didn't pan out, you gave it a shot, which is more than a lot of people can say. And it sounds like the experience was beneficial. Dealing with (and accepting) rejection early on no doubt helped turn you into a stronger person. Glad you got to visit your old stomping grounds! Thank you SO MUCH for sharing your story on this post topic. And I can totally relate as to how you must have felt because even though I was accepted and attended the school for a year, the feeling of not being asked back the second year crushed me at first. But after I got over the initial sting, I decided to keep pursuing my dream by attending another acting school (HB Studios) which ended up being a very beneficial training program for me because the curriculum better suited my approach to acting. "so maybe my blogging adventure is a small way of regaining that feeling of producing something original for an audience again, such as it is." Yes, I know exactly what you mean because I too feel the same way about blogging adventure. Thanks again for stopping by, buddy. Have a super weekend! Thank you, Mark! It ended up being an incredibly valuable experience for me, not only when it came to dealing with and accepting rejection, but it forced me to find my own with acting. I had a very fulfilling career within theater, however, my life took different turn back in the mid-90's and moved in another direction. Thanks so much for stopping by, buddy. Hope you're having a faaaaaaaabulous weekend! This was one of those spontaneous experiences that was such a delight. I had no intention of going back to my old school, but it all worked out that I did. It was so cool to see it again after all these years. Yes, I do so treasure New York City (in fact, I was there again this past week). And perhaps one day I will be living there again. To me, there is no other city like NY! Thanks so much for stopping by, my friend. Hope your weekend is going faaaabulously and that you're enjoying the summer! It would appear that a dazzling spot and I'm happy your have affectionate recollections of your time there. The life lessons you learned due to your experience has served you well consistently. Yes, they've turned out a considerable measure of surely understood performing artists and on-screen characters. I'm wagering for each graduate that "made it," there are numerous more who went ahead to seek after different professions. Wow, what a gorgeous school. I could see how that would be such a valuable experience. Some of our toughest experiences are our best teachers, don't you think? Question: Have you ever watched Glee, and if so - do you think the NYADA school they all seem to end up in after HS is modeled on this school? "Some of our toughest experiences are our best teachers, don't you think?" Yes, absolutely! Which is why I'm glad I had that experience. It was a valuable stepping stone not only in my acting career, but my life in general. "Have you ever watched Glee, and if so - do you think the NYADA school they all seem to end up in after HS is modeled on this school?" I read an article that said the school referred to in Glee is a conglomeration of several acting schools in New York - one of them being The American Academy of Dramatic Arts.